A large portrait of Blessed Solanus Casey was unveiled after the formal Beatification Ceremony, which included the proclamation of the decree naming him a Blessed in the Church. 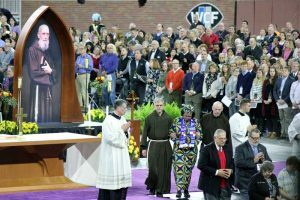 November 21, 2017, Detroit, Michigan – About 20 Adrian Dominican Sisters and Associates were among 67,000 faithful who gathered November 18 at Ford Field in Detroit to witness a historic event: the beatification of Father Solanus Casey (1870-1957). Born in Oak Park, Wisconsin, Bernard Casey joined the Franciscan branch of Friars Minor Capuchin at the age of 26 and was eventually ordained a priest – but not permitted to preach or to hear confessions. He served for years as the doorkeeper at St. Bonaventure’s Monastery in Detroit, and became known for his piety, compassion, love for the poor, and powers of healing. Now that he has been beatified, he needs one more miracle to qualify for canonization in the Catholic Church. The beatification was a momentous event in Detroit – and for many Adrian Dominican Sisters and Associates who have ties to that city. 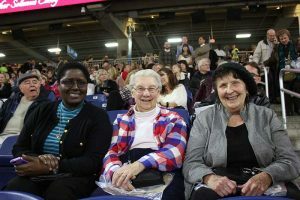 Witnessing the beatification are, from left, Sister Mary Louise Head, OP; Judith Hoppa Saski; and Sister Beverly Bobola, OP. From left, Sisters Emmy Choge, OP, Anneliese Sinnott, OP, and Nancyann Turner, OP, sit with members of the Capuchin Soup Kitchen community. Sister Anneliese Sinnott, OP, long-time theology professor at Ecumenical Theological Seminary in Detroit, was impressed by the diversity of the ceremony, particularly in the choir, the cantors, the Scripture readings, and the prayers of the faithful – read in a variety of languages and reflective of the spirit of Solanus Casey. Sister Virginia (Ginny) King, OP, left, and Arlene Bachanov, Associate. 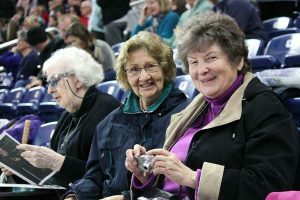 Both Sisters Jean Horger, OP, and Joan Baustian, OP, were impressed by the beatification. 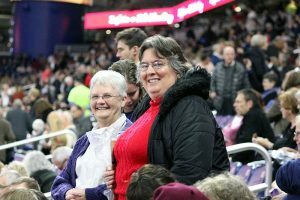 Sister Jean, who for years has ministered in parishes in the Archdiocese of Detroit, was moved by the procession of relics. Paula Medina Zarate – whose 2012 miraculous cure of a skin disease brought about the approval of beatification for Solanus Casey – processed to the altar with a relic of Blessed Solanus. “The whole Mass was very well organized and so profound,” Sister Jean added. Solanus Casey was the second man from the United States to be beatified this year. The Archdiocese of Oklahoma City celebrated the September 23, 2017, beatification of Father Stanley Rother, a local priest who was killed while serving in Guatemala in 1981.